Former Daily Telegraph and Daily Mail health editor Victoria Lambert has launched a new online magazine today dedicated to making health stories accessible to the general public. 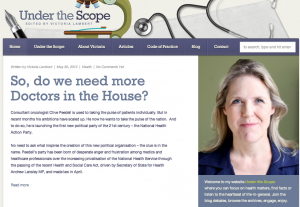 Under the Scope features blog posts, articles and features on topics ranging from specific conditions to general health stories and product reviews. The site is published by Lambert’s own media company Dysart Press Ltd. I wanted to set up a website where people could go for information, to talk about health, to discuss what’s going on with their own health, perhaps to discuss what’s going on with the nation’s health. I want it to be a place where people can think about the NHS, what’s happening to it and what they think should happen to it. But I also want to be a resource where people can go and enjoy reading about health stories, find new information, find out about products, find out about doctors, and also find out where to go for more information because that’s really crucial. I’ve just been speaking to Professor Lord Ajay Kakkar who is director of the Thrombosis Research Institute and professor of surgery at UCL and he’s been telling me about thombosis, he’s one of the world’s experts. To get the chance just to have five minutes with him is so fantastic and I just think it’s great to be able to share that. Everyone who knows me knows I like a chat, I love a conversation. So I’m encouraging people to chat to me across the forum, keeping chatting to me on Twitter. We’ll be blogging every day, if not me, somebody else will be having a shout about something. I really want people to join in, that would be good fun. In the long-term I’d like to think that it’s going to a place not only where the public come but also health experts and also become a place where other health journalists want to put their stories. Lambert’s work has featured in the Daily Telegraph, Daily Mail and the Guardian as well as Woman & Home and SAGA magazine. In 2011 she was recognised as Best Cancer Writer by the European School of Oncology. This entry was posted in Magazines, Online Journalism and tagged health, health editor, nhs, online magazine, Online publishing, victoria lambert on May 30, 2012 by Daniel Bentley. Last week, Guardian journalist and newly-elected Labour councillor for Southwark Rowenna Davis used Twitter to liveblog the heart operation of a two-week-old girl at Great Ormond Street hospital. Her updates were also posted on the Guardian’s NHS liveblog alongside photos she took during the surgery (see above) and tweets from followers. Going through Davis’ @ messages and tweets that used the #nhsblog hashtag shows the response on Twitter was, as she said, “overwhelmingly positive”. The Media Blog called it “A perfect use of Twitter“. But interestingly, the response on the Guardian’s Comment is free site, where Davis blogged about the reaction to her coverage, was almost completely the opposite. The comments that follow the CiF post are almost overwhelmingly negative, with Davis’ live coverage of the surgery called, “mawkish”, “ghoulish”, “a stunt”, “revolting sensationalism”, and more. An interesting point of comparison for the coverage, which has been raised in the CiF comment thread, is broadcast, but it is hard to see people reacting quite the same way about a fly-on-the-wall documentary. A few commenters suggested the problem with Davis’ liveblog was that it was live, and that the risk to the girl’s life made that inappropriate (according to Davis the operation carried a 1 or 2 per cent risk). Whereas a documentary, commenter davidabsalom said, would be recorded in advance. But Channel 4 screened a series of programmes in 2009 that showed live surgery, during which viewers were invited to interact with the surgeons using Twitter, email and the telephone. Channel 4’s David Glover said at the time that the programme was designed to “demystify surgery, encourage discussion and help viewers to understand their own bodies, as well as showing the care, dedication and skill that goes into modern surgery”. Ofcom archives show no record of any complaints about the programme (less than 10 complaints are not recorded). The Surgery Live patients were adults, rather than children as in this case, but Davis obtained consent from the girl’s parents. And the operations – brain, heart, and stomach surgery – seem no less risky than the one in this case. So I can’t help but wonder whether the discrepancy between the responses on Twitter and on CiF stems from the medium itself, with those who use Twitter – and so responded via the network – much more likely to see the coverage in a positive light, and those on Comment is Free more likely to construe it negatively. (I can’t assess how many of those who commented on the CiF post use Twitter, so this is something of a shot in the dark). I think one key dividing line about whether this is defensible is intention. If you’re just blindly seeking ratings for entertainment value, that’s pretty grim. But if your aim is to offer some kind of insight into the reality of the job surgeons face and the trials families have to go through, that seems quite different. Especially when it helps bring to light the importance of the health service, and how vital it is that we get the reforms right. That said, I think the points you are raising are valid, and it’s important to raise them. There are certainly ways in which I could see this being done insensitively. You can follow the full debate here. This entry was posted in Broadcasting, Comment, Online Journalism, Press freedom and ethics and tagged Broadcast, comment is free, ethics, liveblogging, nhs, rowenna davis, The Guardian on June 20, 2011 by Joel Gunter. This entry was posted in Journalism, Newspapers, Online Journalism and tagged Fifa, Journalisted Weekly, nhs, superinjunctions on May 18, 2011 by Sarah Booker. It is run by t he Media Standards Trust, a registered charity set up to foster high standards in news on behalf of the public, and funded by donations from charitable foundations. This entry was posted in Journalism and tagged journalisted, London Marathon, nhs, royal wedding on April 20, 2011 by Sarah Booker. 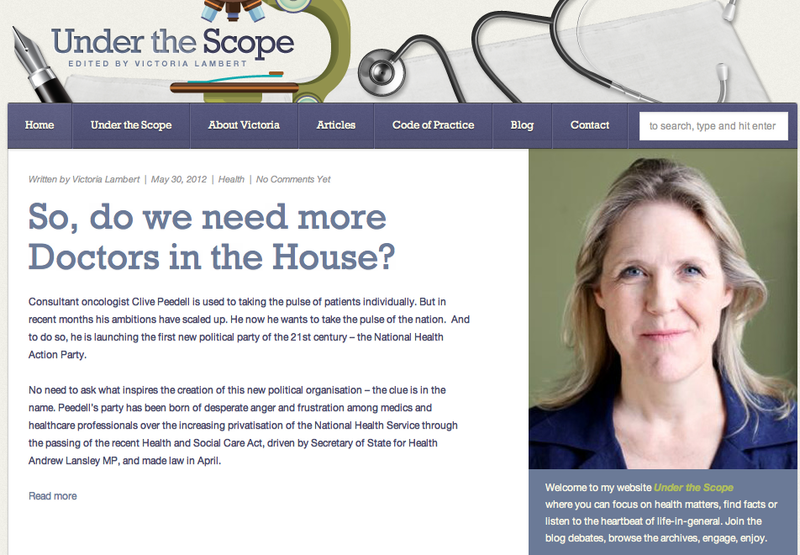 Big Spark Publishing has re-launched a new public sector newspaper, the NHS News. The bi-monthly title has an initial print run of 35,000 and bulk deliveries will be made to NHS Trusts “by arrangement,” How-Do reports. This entry was posted in Editors' pick, Magazines, Newspapers and tagged Big Spark Publishing, how-do, nhs on December 15, 2009 by Judith Townend. BBC Radio 4’s The Now Show picked up on the now-notorious Daily Mail ‘gypsy/NHS’ poll in the first episode of its new series. This entry was posted in Broadcasting, Editors' pick, Online Journalism and tagged BBC Radio 4, Daily Mail, daily mail poll, John Thompson, Journalism.co.uk, nhs, online polls, the now show, The Now Show BBC Radio, Twitter, United Kingdom on June 29, 2009 by Judith Townend. The UK-based Mail Online was forced to shut down one of its online polls yesterday after a concerted campaign by Twitter users and, Journalism.co.uk can reveal, UK-based psychologists, nearly brought their servers to a halt with an overwhelming ‘yes’ vote. 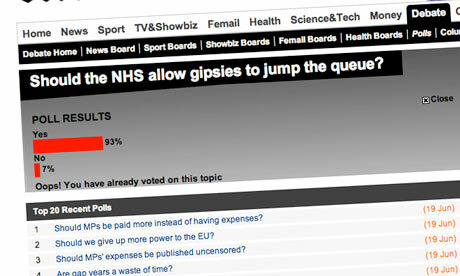 The poll, which asked the somewhat leading question “Should the NHS allow gipsies to jump the queue”, attracted ridicule from many within the Twitter community leading to, at one point a 96% vote in favour of the proposition. Brighton-based senior lecturer in experimental psychology Dr Sam Hutton contacted Journalism.co.uk today to reveal that there was also an email campaign among UK-based psychologists who, as part of their jobs, take questionnaire neutrality seriously. “One reason I think there were so many yes votes was because a psychologist got hold of it, and sent an email which quickly got copied to virtually every psychologist in the country, suggesting that we all vote yes as a way of protesting against such a ludicrously loaded question (psychologists care about questionnaire design),” Dr Hutton said. Angered Twitter users have now vowed to take their campaign to all of the Daily Mail’s online polls, taking the opposite stance to the expected response, given the Mail’s reputation for having a ‘Middle England’ readership and an editorial line against what it sees as the liberal establishment. Footnote: Readers from outside the UK might be also interested to read about the Mail’s history – in the 1930s it openly backed the British Union of Fascists, aka the Blackshirts. This entry was posted in Newspapers, Online Journalism and tagged brighton, British Union of Fascists, Daily Mail, Daily Mail Online, Journalism.co.uk, nhs, online newspaper, online polls, psychologist, Sam Hutton, senior lecturer, The Daily Mail, Twitter, United Kingdom on June 20, 2009 by John Thompson.